Model A now for sale in Europe – buy one today! RS Components and Premier Farnell/element14 have Model A Raspberry Pis in stock as of this morning. (See the Where To Buy area on the right side of the page for links.) For the first tranche of orders, Model A will only be available in Europe. We’ll lift this restriction very soon so the rest of the world can order too. The Model A is a stripped-down version of the Model B Raspberry Pi, with no Ethernet, one USB port and 256MB RAM. If you’d like to learn more, check out this post from a couple of months back. Stripping down the Model A means it has two important differences from the Model B: we can make it ten dollars cheaper, at $25; and it consumes roughly a third of the power of the Model B, which is of key importance to those of you wanting to run projects from a battery or solar power: robots, sensor platforms in remote locations, Wi-Fi repeaters attached to the local bus stop and so forth. We’re working on software to get the power consumption even lower. And we’ve seen how well XBMC works on the early 256MB Model Bs we sold last year; it’ll work just as well if you want to make a $25 media centre out of your Model A.
RS customers outside Europe (Allied in the US) can order a Model A now, but there will be a short delay in processing their order because we’re waiting on some paperwork before the Pis can be shipped. Farnell customers outside Europe (Newark in the US) will see Model A appear on their local sites when this paperwork has been filled. We are very, very pleased to finally be able to offer you a computer for $25. It’s what we said we’d do all along, and we can’t wait to see what you do with it. A Model B 1.5 board for $40 will all the IO’s, except the SD card, on the back and the SD card port on the front. That would make my life so much easier for mount the board in a box. The extra $5 is because I assume that to do this they would have add about of centimeter of silicon to the board and time (cost) to plan it out. My brain processed that sentence in Dr Zoidberg’s voice. I’ve bought one, since I don’t need ethernet (I’ve never used it with my previous Pi) and uses less power it will be great, certainly going to plug it into my lapdock, can’t wait to have it into my hands. I need one! (For the reduced power consumption.) But Farnell (UK) only shows “coming soon”. If you go via the Element14 main page (http://www.element14.com) and search for 2254699 product code, you can order it there it seems. Thanks for that. Had to order a spare power supply to get over the twenty minimum, though. My new project needs 6, right now … where’s my Visa card?! Does this mean that the “$25 PC take a byte” tag line can go back on the web page? Reluctantly have ordered from RS. Hopefully their service will be better than the debacle this time last year. £4.95 Delivery to the UK with estimated 1 week delivery!!!!!!!!!!!!! say: “Your RaspberryPi order has been despatched today. If you ordered a Raspberry Pi board as part of your order we are pleased to inform you that we have sent you the upgraded 512MB Revision 2 board to thank you for your continued patience. We hope this upgrade is acceptable to you”. Either I’m getting a model b (which I didn’t order) or RS know something that I don’t. Can order if you start from the Element14 front page (about 19 pounds) ,although min. credit card order is 20 quid, so maybe throw in a 5V USB psu as well or something. 1700 there for next-day delivery just now, looks like. 6 on order from RS – The Raspberry Pi Chamber Orchestra (Model A) is on its way to a town near you real soon now!! Now the inevitable question; When’s the Camera coming!!! How is the USB port driven on the model A? Is there a USB signal on the 4 through holes that would have connected to the second USB? The USB port on the Model A is directly routed to the BCM2835 – the other set of holes are unconnected (as they would have come from the non-fitted LAN chip). It lacks the ethernet chip which contained the USB hub giving you the extra port. So no, there’s only one USB, driven directly from the SoC. I’m somewhat academically interested in whether this USB port can be made to work as a gadget port now that the USB hub is out of the way, though. Also note, if you don’t plug in an SDCard it will try and boot from a PC! It isn’t connected, but you can desolder and replace the USB connectors on a Model B if you need a lower-profile Pi. All is not as it seems with Farnell’s pricing. The order page shows Model A before VAT at £15.97 (which you have to bump up to at least £20 before VAT by ordering other stuff). The PDF invoice they sent me, however, shows the Model A, before VAT, at £19.03, to which VAT is then added, making the price £22.84. So my Model A, with the extra PSUI didn’t really want but had to order to get over the £20 minimum, is costing me £28.92. And the PSUs aren’t even in stock. I’ve seen the same with my order. At least shipping was free, and I was able to add a micro-USB cable for about a pound to bring my order above the minimum. I’m awaiting confirmation from Farnell as to which price is correct – the quoted one on the website, or the one in the invoice. I tried that! But because the Pi price was shown as £15.97, adding an inexpensive cable didn’t bring it up to the £20 minimum – so I had to order a PSU. It’s not really a problem – I had been thinking about buying another PSU anyway – but a lot of people expecting a model A for the advertised price are going to be disappointed. CPC are showing the Model A as in-stock at £18.88 inc. VAT, and they are doing a free delivery week. Just enter code WEBFREE at the checkout. RS just charged me £4.95 for delivery. CPC Farnell offer free delivery with the WEBFREE offer but when I tried to order a couple of cables this morning there was a £5.95 “handling charge” added. Is this handling charge added to the RPi ? In the past when I’ve ordered and used the WEBFREE voucher code the handling charge is shown initially, but is manually removed before dispatch. I ordered one from them at around 3pm this afternoon using the WEBFREE code, and they have already charged my credit card to the full amount – ie £26.02 instead of £18.88. I am finding it impossible to contact them, and although the item is marked as payment RECIEVED on my account, it seems impossible to cancel the order online even though it hasn’t entered the dispatch phase! IIRC last time I used WEBFREE they charged me for the delivery initially and then refunded that charge a few days later. Thanks Peter, I have emailed them and asked what they’re up to. I hope you are right! So things ain’t that bad – If only they had made that clear in the order process! Did you put the code in the ‘Voucher Code’ because you’re meant to put it in the ‘Order Notes’. However, as you can see from my message above they have still charged my credit card for the full amount. I don’t think I would trust them again. I wouldn’t go bashing CPC quite so fast :) They have exceptional customer services. They work incredibly hard to get these things online and on sale as fast as possible…there is no other product in their books that demands the level of attention that the Pi does. If you have any issues, contact them, and they will sort you out. And not, I don’t work for them, I have nothing to do with them other than being a very happy customer of theirs and happy to say so. Raspberry Pi is usually sold out too quickly. Very difficult to find. Glad to see this has finally landed! wow, lucky you :) congrats! This will be very useful for Raspbmc setup – all you need is a compatible wifi dongle. If you set up the wifi settings on the boot partition before putting the SD card in it should all automagically install for you. Makes me wonder if they might start working on a “Model C” now that the Model A is officially out. HUMMMMM…..What would a “Model C” look like? Silly. The next model will be the Raspberry Pi Master. The Model C will have wifi instead of Ethernet. And a Li-Ion battery underneath. A a frickin laser diode mounted on it. Beware our new Raspberry overlords! Can we get it with a tin of *biscuits? *Please note this is English and not English. How can we connect it to internet? You should be able to connect USB wifi dongle just like Model B’s or even wired LAN dongle if desired. I just noticed that the absence of ethernet on the Model A gives me a couple more useful mounting holes for a Shapeways custom base / support. Sweet. Still got that capacitor right next to the power in I see. Any chance of that it’s at least a little more flush to the board? It doesn’t seem to be available for order on the Allied website. Does anyone have a direct link? Good timing.. I’ve just ordered one to replace the Model B I managed to destroy at the London Raspberry Jam last week! Will be putting it in one of my BigTraks as they don’t need Ethernet and one of them only requires a single USB port. You (as in RPi Foundation) have done a great job. Apart from the amazing effort to get these little computers on sale, you have generated a huge interest in computing. I have a son and I’ve watched him learn to programme. His peers think it’s really cool and they want to try too. Really great stuff. Thank you. said me: item is not available. Without at least WiFi (at least another $5-$15), it would seem like you need to keep swapping out the card in order to install new software, or receive updates. The handiness of being able to quickly do this is worth the higher model. This Model (A) seems to be geared at those who already have all they need (eg. to program their Robot/circuit/Scratch) if they truly can solely work on this isolated environment. It’s novel to be able to provide a low cost system, but there comes a point where it seems more of a handicap than a cost savings. I understand that standard images can be deployed easily in a classroom (networking might not be needed), but for the hobbyist, it’s a tough sell if TCO is higher. Also, personally I use vnc to run startx because I don’t have an extra monitor. Classrooms may also suffer from this, and it may be easier to use the laptops the kids may already have, once again having the need for some sort of connectivity. I’m interesting in the education packages teachers / developers will be designing that would need to make decisions based on what other old parts are available. For XBMC, I’d recommend still sticking with Model B to stream 1080 wired. You’re missing any mention of the power consumption: in a lot of applications that makes an *enormous* difference, whether or not you’ve added wifi. You’ll be wanting a Model B if you want all that. Right now, I guess the Model A is going to be best suited to autonomous embedded applications….think ‘bot, standalone automation control, etc. Yep, I get that. But I was referring to the original mission to bring computer education to students for cheap. School boards need to look at the total cost of ownership, not just the base price. My argument is that whether it’s 25 or 35, it might not really make a difference in many education scenarios. My understanding is that hobbyists are just a side benefit. 25 or 35 might not really make a difference on many education scenarios..
none at all, 1 of each three for free isn´t enough for you? WTF!! guess you are not so much aware about the schools reality around the world.. The link above got into the right place…2 Model A boards on their way…next day delivery it claims, but I won’t worry about it too much :) My wife is going to kill me….this will be no. 13 & 14 ;) …eek! Excellent work by the foundation!! Congratulations! Pray god they don’t start breeding…. Hi, Any chance we can have a view on lower power consumption ideas? No; the colour of those ports seems to change with the weather. (I think there are blue ones out there too.) They’re all the same thing, but for some reason the various batches that we’ve bought have come in several different colours. Are these rev 2 boards or rev 1 boards? I wonder, though, if there will soon be a model A revision 2 with 512 MB (or even 1 GB) of memory, for a higher price, of course. The reason why that would be great is the low power consumption combined with a larger amount of memory. Sorry for sounding so down though -this is great news! Hi, I haven’t been paying attention this last week, anything happening with Raspberry Pi? Finally! 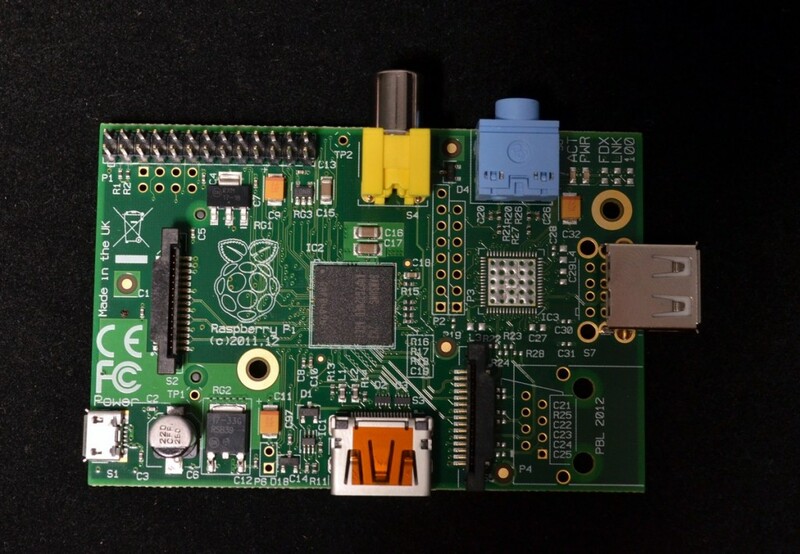 Now Raspberry Pi can claim the 25 USD price for real. I wish that Model C will move the connectors, and make it thinner. In the meantime, I hope that other people are inspired by my PiPod – a Raspberry Pi inside an original iPod! Does the “A” model production cycle affect the amount of “B” models coming out of the “factory?” How does that work? As you can see we demand more of each! Congratulations on getting the model A out the door!. This will go a long way for educational use and I am sure we will see even more cool projects now!. I ordered a low power Model A from Farnell last night and at 09:55 today the package arrived with despatch note and box clearly marked as Model A. Brilliant service! The only problem was that the box contained a Raspberry Pi complete with Ethernet chip and connector and a double USB socket. Clearly a Model B.
I bought 2x RaspberryPi, €33+€6, 1 week delivery, but full version B. Excellent computers! I think version A (256 MB, only one USB, no LAN) isn’t worth the lower price. Only worth for special use. I placed an order from one of the models with Farnell on the first release day, did anyone else do that and know if they will be honouring these orders? I didn’t think you were able to order the model A until now. Are you saying you ordered an A on Feb 29th 2012? Odd. No-one else was able to. They didn’t go on sale till last week. Where did you order from? What happened with shipping into Luxembourg? Anyone know of Model A cases ? I got a catalog from some US distributor last month which showed a molded plastic case with the ethernet and USB cutouts adjustable for either Model A or Model B. Forgot which one it was, though! Just ordered one for my daughter, she’s 6 so she’ll probably only use it for XBMC at the moment, but as she gets older I’m hoping I can help her tinker around with it, maybe even just get her a model B to play with too. We’re looking forward to the lower-power and lower-price features, and hope to be able to receive bulk orders before the February “29th”, 2013 anniversary celebrations! Perhaps the international distribution was going to take a while to sort out, so they had to limit the first ones to keep the packing and posting a local operation… I base this on comments a while ago that the Model As might at first be produced by the foundation themselves, and at the Wales plant, only. I’m just speculating though. Well, I ordered 2 model A Pis from CPC Farnell on Monday afternoon at around 4pm, and the arrived yesterday morning. About 18hrs delivery time :) Marvellous little things, too. Will check out the power consumption tonight, and will start modifying my Blender model for the differences. I am having to get my RPi’s through Singapore (living in VietNam) but what I am trying to get is the latest, as manufactured, mechanical details of the RPi PCB. So far I have three versions. My most critical need are relational dimensions between the PCB connectors and the (2) mounting holes and between the two connectors themselves. I am making an add-on board without a RPi for school related use. I have a ‘water jet’ cutter so trimming manufactured PCB’s is no problem if the boards are oversized. Any URL’s of the very latest version would be appreciated. I hope you realize that the dimensions of the PCB will be exactly the same as the (revision 2) model B PCB, as exactly the same PCB is uses to produce model A’s as for Model B’s. I believe full disclosure of model B revision 2 boards have been around for some time. (but don’t ask me where). I appreciate your comments but many of the specifications vary. I have two actual units and they are different from each other! Pity Raspberry Foundation can’t issue a final version, and make the manufacturers stick to it. For every production run. I’m sorry, but that’s not how it works. If a board needs to be changed for a particular reason, it will be changed. But all the production will then move to that new design (there may be some overlap as different sites run down old stock). So all manufactured at the moment will use the same design. Some components may vary very slightly (colour etc), but that’s about it. So you just need the latest board from which to get measurements, if you cannot find the data elsewhere. Excellent news. I expect some people will lament the reduction in RAM compared with the Model B, but it’s not such a bad thing. My first computer had just 0.5 kb (yes, kilobytes!) or user RAM until I upgraded it and entered the dizzying heights of 8kb. It certainly made me write compact code. None of the bloated software we see today! If I could order from Farnell (they don’t sell to private persons though) the Model A would cost me 38.14 EUR, that’s 51.065646 U.S. dollars. So if I live in US I would get two RasPi’s for the price of one. Thank you. I completely agree with the idea of adding wifi onto the board as a C version, just put that on it instead of the ethernet and add the 512MB memory, I’d defenitely buy that. I have a B version and absolutely love it. I’d say having WiFi on it makes more sense than the Ethernet – the goal of this product is to get kids a cheap computer so their parents won’t worry about them trashing the main one. Most parents wouldn’t let their kids trail a long Ethernet cable around the house, let alone into the kids bedroom so he can hook the pi up to his TV. Ethernet may perform better than WiFi and be better in a lot of ways, but it’s just too impractical and that’s why almost every tablet, phone and small laptop ships without it. Even my Samsung series 3 doesn’t have a port for it! Kids could also set up their phones to be WiFi hot spots if they didn’t have proper internet at home if the pi had built in WiFi support. I know you can do most of this with a WiFi dongle but then you lost a USB port and if you have to buy a powered USB hub/WiFi dongle you have upped the price out of the range of some kids. @edwinj85 – adding wifi built-in is a real pain for certification. That’s why lots of laptops have the wifi on a mini-pci card. If it’s a separate ‘peripheral’ you can use its own paperwork. I ship Model A boards worldwide! Laser cut cases coming soon too! Any ETA for the US? I reached out to Element 14 today and they had no answers.